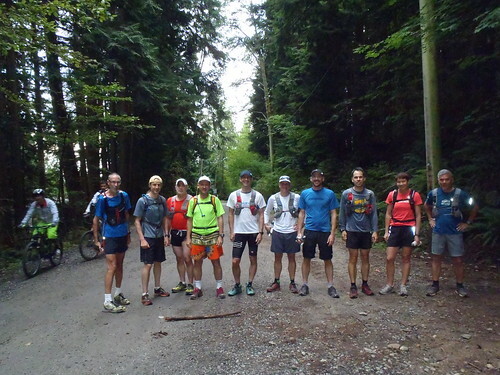 Trail runners, especially ultrarunners, have long recognized Old Mountain Highway in North Vancouver, British Columbia, as a great place to train. 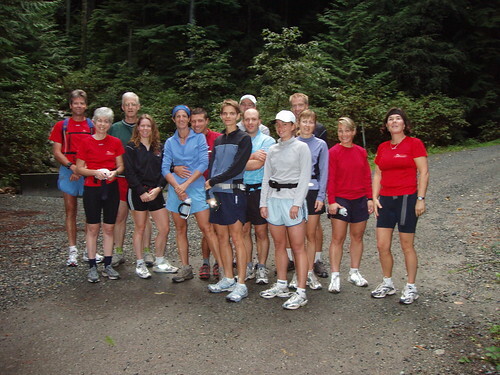 The inaugural Mountain Highway Madness was hosted on 7 April 2001 by Ean Jackson as a training exercise for the Diez Vista 50k trail run. There were 6 starters, and 7 finishers. Given almost all of Old Mountain Highway was covered in snow in April 2002, the event was cancelled. On Easter Sunday (20 April) and again on 18 May 2003 records fell in almost every category. A little more structure was subsequently added to the event in the form of this website and more formal record keeping. Mountain Highway Madness is now held twice a year. 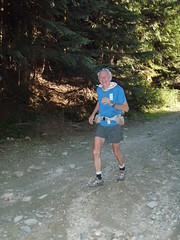 The dates were chosen to make this even a great last training run for those participating in the Diez Vista and Silvertip 50 kilometer trail races. The odometer rolled-over on Mountain Highway Madness this year. I thought I’d propose something a bit different for the 10th anniversary. Why don't we make it a group run and bag a peak while we're at it? Swad had to be different. He signed-up to do laps. "How many laps you going for, Swad? ", I asked. "Oh, I don't know", he answered. He didn't appear to have any food and he was going solo. I figured him for 2. It was nice to see the familiar faces and great to see several new fat-asses. Cressman and his gang came from East Van. Frank came all of the way from South Africa! We started promptly at 7:30. The fast folks took off as a group, but no worries... I was the only one who knew how to find the trail to the peak of Fromme, so they had to wait. 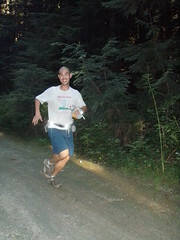 Swad had a big smile on his face and looked fresh as he made his way downhill. 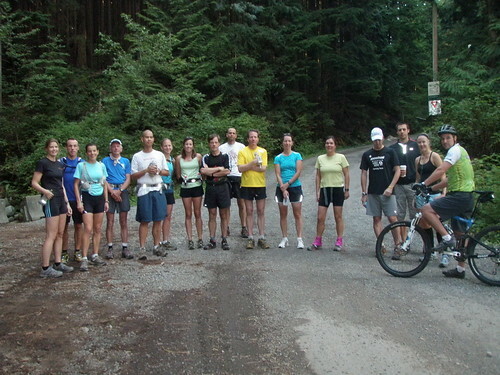 A large group waited at the turnaround... an abandoned stone quarry. I offered bonus points to whoever grabbed a rock for my rock wall project, but got no takers. Bill's Trail is a lesser known, runnable gem that leads to the summit from the quarry. 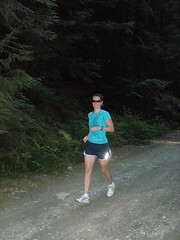 We had barely changed gears from gravel road to single track when I let out a holler, "Purple Corts!" Rick, Cressman and some of my other frequent trail companions shook their heads, but I believe most of the others were startled when I abruptly stopped to photograph several large, velvety purple mushrooms just off the trail. Yes, after a summer of dry heat, the recent monsoons and warm, humid weather were perfect for mushrooms... and there were gobs of good ones (3 types of yummy boletes!) at higher altitudes. 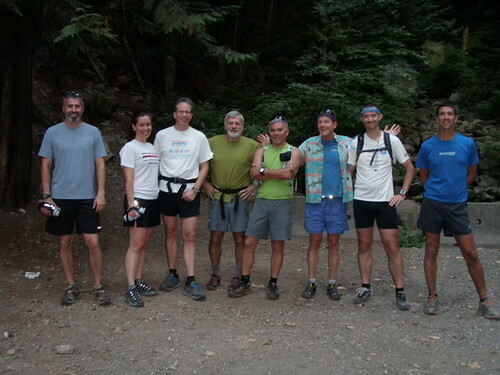 It was a mob scene at the summit of Mount Fromme. By my reconning, a Bagger Challenge world record for the most people to simultaneously bag a peak! Given the fog, there was not much of a view, but we did find an ammo box full of cool stuff (geo-cache). Only 2 people had signed the log since Bill's Great Peak Ascent last year. I noted the occasion, but had nothing special to trade. Rather than take the same trail back, we opted to take a longer route back to Mountain Highway via a secret lake. Rick calls it Leech Lake. There were no takers for a skinny dip. The descent was steep and super-slippery. It’s a miracle nobody broke an ankle. I shared the story about the time Bill and I got off the trail and spent several hours whacking through devils club somewhere to the east of this trail, but being concentrated on their foot placement, I don’t think anyone heard it. Back on the dirt road, the fast boys cranked it up and took off. There were lots of mountain bikers heading up as the rest of us headed-down. 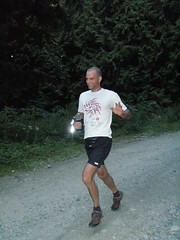 There was some discussion about dropping in at the Van Tan Club as we neared the bottom of the hill, but concensus was that we were overdressed in our running shorts and tech t-shirts. Near the bottom, the group I was with added another special bonus to the run and took a new mountain bike trail in for the last 500m. Apparently, we missed seeing Swad head up for lap 3. All-in-all, a fine day to be on the trails. 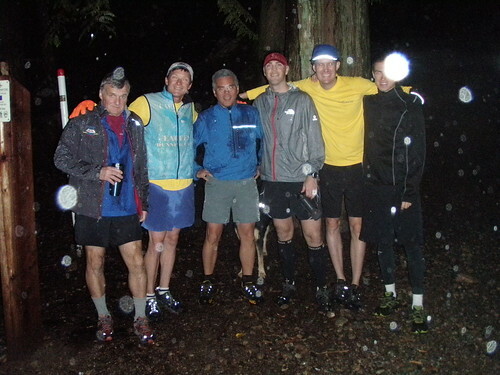 Congrats to all who did a lap and bagged a peak on the 10th anniversary run... and a respectful tip-of-the-hat to Jim Swadling, who joined the elite few to have gone platinum (4 laps... 60K) on water and cold pizza!!! PS Congrats to Frank for winning a purple heart for twisting his ankle and for travelling the farthest. 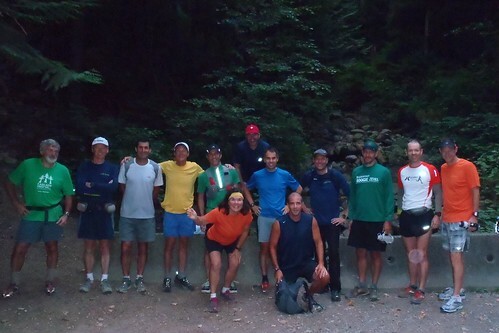 You get a subscription to Trail Runner Magazine!